The one-word secret of the greatest investor you’ve never heard of | City A.M.
I’m a member of the value team at Schroders and an author on The Value Perspective an investment blog. Type a phrase such as ‘world’s greatest investors’ into Google and Philip Carret’s name is unlikely to crop up. 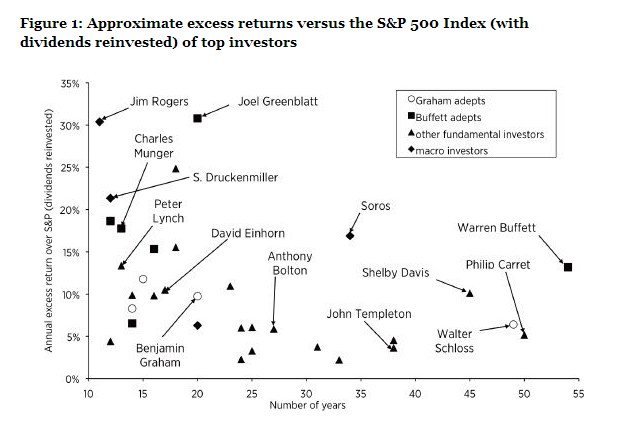 And yet, as the following chart shows, for sheer longevity of success, he is one of just a handful of investors who can be mentioned in the same breath as Warren Buffett. That is why his autobiography A Money Mind at 90 (1995) was top of my list for The Value Perspective’s inaugural reading week this summer. As a matter of fact, purely in terms of years spent as an investor, Buffett still has a little way to go to catch up with Carret, whom the Sage of Omaha has described as “one of his heroes”. The above chart only covers the various legends’ time spent managing mutual funds, whereas Carret – who set up the fourth-ever such vehicle, the Pioneer fund, in 1928 – was an active investor until his death, at 101, in 1998. Active, yes, but only in the most disciplined of ways. For the number-one lesson learned by this value-oriented investor over the course of seven decades – through the Great Depression, the Second World War and numerous market cycles – is that the key requisites for successful long-term investing are stamina and patience. Traders rarely die rich, patient investors often do. By its very nature, of course, this is a deeply unexciting message and one that many investors are reluctant to hear as the secret of making money over the longer run – but it is no less valid for that. And it is an idea we are more than happy to buy into on our Value Perspective blog – even if it naturally follows that if we believe patience is the best way of investing in value, then our long-term investors will need to be patient too. You make most of your money in a bear market – you just don’t realise it at the time. The former of course is from Warren Buffett, the latter from Shelby Cullom Davis – like Carret, a great of value investing who deserves to be better known. To spread some of Carret’s wisdom a little more widely then, here are 10 of his quotes, organised by the three key lessons we took from – or at least had re-emphasised to us by – A Money Mind at 90. Patience and stamina are requisites for successful long-term investment. I have known many [investors] who are a great deal smarter than me but they haven’t had the mindset. After [one unsuccessful investment] I tried to review the mental process that had led me astray – my ego. The stock market only bears a rough relationship to the business cycle and is characterised by much wider and more violent swings. I hold [stocks] for the long haul. I’ve seen a lot of recessions and I can live through them and I can do it again … perhaps. Never try and time the market, or look at the overall price level of the market – look at the individual stocks you’re buying. The job of a money manager is to determine relative values. Look at the interest cover in the least profitable year in the last 10. [On management quality] Read their letter and, if it is too optimistic, that’s a bad sign. It should mention problems as well as results. Then they should have at least one year’s salary in stock. In the short term, stock market prices are based on emotion; in the long term, value is what counts. Simon Adler is an author on The Value Perspective, a blog about value investing. It is a long-term investing approach which focuses on exploiting swings in stock market sentiment, targeting companies which are valued at less than their true worth and waiting for a correction.